FORT WORTH, Texas – The Davey O’Brien Foundation has announced that Craig Morton is the recipient of the 15th annual Davey O’Brien Legends Award presented by Low T Center, while Verne Lundquist is the Charles Ringler Founder’s Award honoree. Both men will be recognized at the 39th annual Davey O’Brien Awards Dinner at the Fort Worth Club on Monday, Feb. 15. 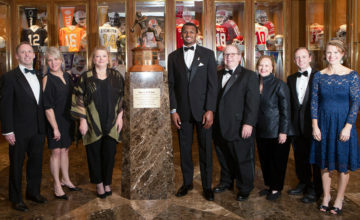 In addition, 2015 National Quarterback Award winner Deshaun Watson of Clemson and the to-be-named Davey O’Brien High School Scholarship winner will be honored. 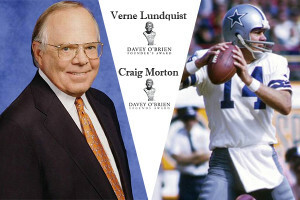 NFL Hall of Famer Roger Staubach, Morton’s former Cowboys teammate as well as the inaugural Davey O’Brien Legends Award winner, will be a featured presenter. Morton played 18 seasons in the National Football League (1965-82) with the Dallas Cowboys, New York Giants and Denver Broncos. In 1970, Morton led the Cowboys to their first Super Bowl appearance (Super Bowl V), and seven years later he directed the Broncos to Super Bowl XII. He won a Super Bowl ring in 1971 as a member of the Dallas Cowboys. 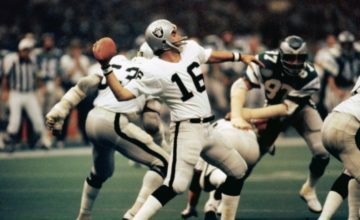 He was the first quarterback in NFL history to start Super Bowls for two different teams, and remains one of only three, alongside Kurt Warner and Peyton Manning, to accomplish the feat. In addition, Morton is one of just 20 quarterbacks ever to start multiple Super Bowls. For his career, the native of Flint, Mich., threw for 27,098 yards and 183 touchdowns. His career highs in passing yards (3,195) and touchdown passes (21) both came in 1981. In 1977, Morton was named the UPI AFL-AFC Offensive Player of the Year and NFL Comeback Player of the Year after helping the Broncos reach the Super Bowl for the first time. After graduating the Campbell (Calif.) High School, Morton became an All-American at the University of California. He was inducted into the College Football Hall of Fame in 1992 and also is a member of the Cal Athletic Hall of Fame. He was a first-round pick (fifth overall) in the 1965 NFL Draft by Dallas. Lundquist is the lead play-by-play announcer for CBS Sports’ coverage of college football. He was inducted into the National Sportscasters and Sportswriters Association Hall of Fame in 2007. Nationally, Lundquist has worked for ABC Sports (1974-81), CBS (1982-95, 1998-present) and TNT (1995-97). He has also called play-by-play on national broadcasts for NFL football, NCAA March Madness, the Masters Tournament, the PGA Championship and the Winter Olympic Games. The native of Duluth, Minn., is a former radio voice of the Dallas Cowboys who joined the Cowboys Radio Network in 1967 and remained with the team until 1984. He was named the Texas Sportscaster of the Year for seven straight years (1977-83) during his time in Dallas. Lundquist is a member of the Davey O’Brien Advisory Board and also serves as the chairman of the Davey O’Brien National Selection Committee. 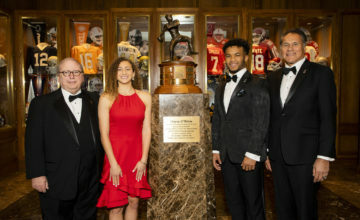 A limited number of individual tickets for the 39th annual Davey O’Brien Awards Dinner are available in the Sunset Room for $250 each, a portion of which is tax deductible. Please contact the Davey O’Brien Foundation at (817) 338-3488 for more information. Founded in 2010, Low T Center has quickly evolved into a pioneering and innovative medical practice. Low T Center exclusively diagnoses and treats men with low testosterone levels, currently with over 40 locations across the country and growing with the awareness and demand for testosterone therapy. Low T Center differentiates itself by focusing on the needs of their patients. Their main goal is for every man age 40 to 60 to know their testosterone level. For more information about low testosterone and treatment, visit www.LowTCenter.com.